Whether it’s a new space or an old one, your ceiling may be starting to get crowded. If your space is “public,” you’ve got considerations that most others never need to think about. Namely, how to keep hands off your devices. We know that you're looking for solutions that protect your building, followed closely by a way to maximize its aesthetic. For you, it’s no longer acceptable to simply pop ceiling tiles and go about your business. Having antennas poking down from ceiling grids just isn’t impressive—or safe. Fortunately, there are ways to address each of these concerns. 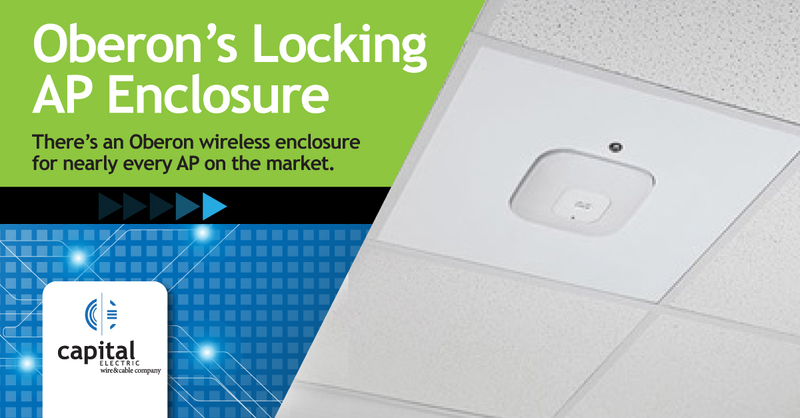 Oberon offers a solution that allows you to mount your new access points (APs) in a clean enclosure that blends into the ceiling. Designed for wireless, it is also the perfect solution to protect from unauthorized access. Here’s another added benefit: once installed, the enclosure permits entry from below the ceiling space. This means you will no longer need permits to update an AP. Simply open the enclosure from below, update the device, close the door and move on to the next task… all without touching a ceiling tile. Imagine how much time that will save! Watch this mounting solutions for WiFi access points video for more information. There’s an Oberon wireless enclosure for nearly every AP on the market. The team at Capital would be happy to help you find just the right one for your needs.